Dog Vision: What Colors Can Dogs See And Can They See In The Dark? What Colors Can Dogs See And Can They See In The Dark? Even as man’s best friend, dog vision is often misunderstood. 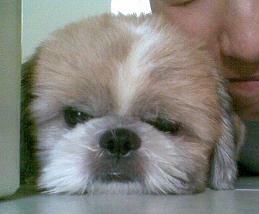 Many of us assumed that our dog see the world just like we do. Others would think that dogs are totally color blinded and they live in a world of shades and grays. Dog vision is very different from human vision in many perspective. What your dog is seeing from the television is very different from you do. Visual acuity is the clearness of vision, including the ability to see things in fine details. Dog eyesight usually is around visual acuity of 20/75. This means that if you have a perfect vision of 20/20; what you can see at 75 feet (23 metres) clearly, your dog can only see it at 20 feet (6 metres). So don’t expect your dog to recognize you from a distance. They actually recognize you through smell, sound and familiar motions which you made. It also means that what they see on television is usually fuzzy. 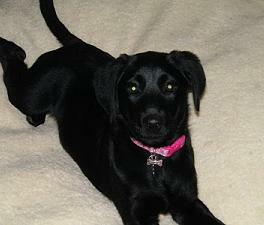 Certain breeds such as Labradors have better visual acuity. They are bred for better eyesight (commonly used as seeing-eye dogs) and may have vision that is closer to 20/20. Preys like rabbit and deer have eyes on two sides which allow them to see two directions at one time. This is so that they can scan their surrounding better for predators with their wider field of vision. Whereas predators such as cats and dogs have their eyes right in front of the face. This enables them to have better depth perception and binocular vision to pursue and attack more accurately. Even though human’s eyes are in front just as dogs do, dog’s eyes are slightly further apart, usually set at a 20 degree angle. This increased angle enables them to see a 240 degree field of view even when they are looking in front, as compared to human’s 180 degree field of view. However, the enhanced field of vision does compromised the amount of their binocular vision. Binocular vision is the field of view where the two eyes overlap and gives us depth perception. 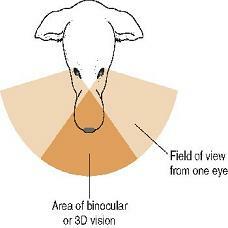 The wider apart distance reduces the field of view in which the eyes overlap, thus reducing dog binocular vision. It also causes them to have more blind spots in their depth perception. Dogs have more rods than cones in their retina (the back of the eye in which light lands). Cones and rods are light sensitive cells. Cones primarily work in well-lit environment. They are less light sensitive, and are responsible for high resolution vision and color detection. On the other hand, rods are responsible for night vision and detecting motions. Having more rods in retina enables dogs to see better in the dark. Additionally, they have tapetum lucidum (the reason why your dog’s eyes seem to glow in the dark) to improve their night vision further. Tapetum is a layer of highly reflective cells behind the retina that acts like a mirror. And reflects back light, giving the retina a second chance to register whatever light that enters the eye. Although the tapetum improves dog vision in dim light, it also scatter light. Which is why dog vision is 20/75 instead of the normal 20/20 vision. Contrary to what many people think, dogs do not see the world through shades of grays. Having only one-tenth the level of cone concentration that humans have, dogs see color differently. However, it doesn't mean that they don’t see color at all. Cones are responsible for color detection. While humans have 3 types of colored cones, dogs only have 2 types. This means that they have smaller spectrum of color than we do. In many ways, they are similar to color blinded people who have red-green color deficiency. Having their retina made up of mostly rods mean that dogs have higher peripheral vision - the vision that is outside the center gaze, than human. Dogs have high level of visual cells concentrated at the across the retina called visual streak. These streaks allow them to see sharp-focused objects even at the extreme ends of their peripheral vision. It is also the reason that triggers their urge to chase after moving objects in their peripheral vision. Even though dog eyesight is worse than human's, they can detect small movements way faster than us. 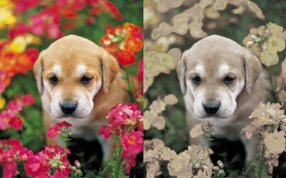 Motion sensitivity has been noted as the critical aspect of canine vision. Due to having more rods, dogs are much better at detecting moving objects than stationary ones. Which is why small changes in your body posture mean a lot to your dog. Dog also see flickering lights better than human do. As a result, rather than watching TV in a continuous flow like humans do, dog vision offers flickering frames. Dogs are subjected to eye diseases just like human do. They are vulnerable to both minor diseases such as conjunctivitis (pink eye) and eye stye, and serious diseases (blindness) like glaucoma, cataracts and macular degeneration. As eyes are important in your dog’s well being, bringing them to the veterinarian at the first signs of symptoms is crucial.